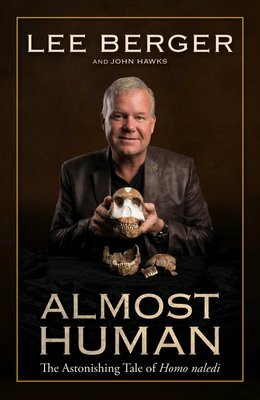 Almost Human is the personal story of a charismatic and visionary palaeontologist, a rich and readable narrative about science, exploration, and what it means to be human. In 2013, Wits University reasearch professor Lee Berger caught wind of a cache of bones in a hard-to-reach underground cave near Johannesburg. He put out a call around the world for collaborators – men and women small and adventurous enough to be able to squeeze through 8-inch tunnels to reach a sunless cave 40 feet underground. With this team of ‘underground astronauts’, Berger made the discovery of a lifetime: hundreds of prehistoric bones, including entire skeletons of at least 15 individuals, all perhaps two million years old. Their features combined those of known pre-hominids with those more human than anything ever before seen in prehistoric remains. Berger's team had discovered an all new species: Homo naledi. The cave proved to be the richest pre-hominid site ever discovered, full of implications that challenge how we define ourselves as human. Did these ancestors of ours bury their dead? If so, they must have had an awareness of death, a level of self-knowledge: the very characteristic we used to define ourselves as human. Did an equally advanced species inhabit Earth with us, or before us? Addressing these questions, Berger counters the arguments of those colleagues who have questioned his controversial interpretations and astounding finds.